The Snowman was masked so the trees could be stamped. To make the shaker, I cut the width of my foam tape about 1/8" and adhered it to my glass, then added the micro beads. Gently removed the protective backing (or your beads will fly everywhere), then adhere your stamped image. 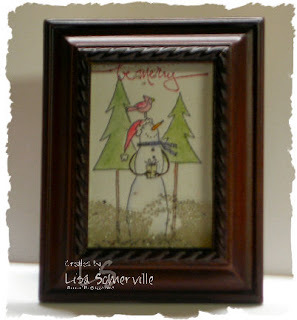 Now you have a cute little Snow Frame, all ready for your gift giving! Lisa, this frame is so cute! I stamped tonight and need to stamp tomorrow to do my moving thing. Great job! Applause! clap, clap, clap! This is so neat! great job Lisa - never thought to make a shaker in a frame!! Womderful Lisa. Great creativity with the framed shaker! What a great project, Lisa! Very innovative! I love the paper too--I have that as well! This turned out so cute, Lisa! Love making it into a frame! I made a snowman shaker, too! Great idea Lisa! I never would have thought to frame a shaker. It is super cute and a great gift! What a great idea to turn a photo frame into a shaker! So fun! Oooh! Love this!!! What a great idea to use a frame! Lisa! That is such a great idea for a gift and it's so cute! Shake your Christmas booty! That is so cool. Great idea. Love it.